Buddy Ebsen, (born Christian Ludolf Ebsen Jr., April 2, 1908 – July 6, 2003; also known as Frank "Buddy" Ebsen) was an American actor and dancer whose career spanned seven decades. His most famous role was as Jed Clampett in the CBS television sitcom The Beverly Hillbillies (1962–1971); afterwards he starred as the title character in the television detective drama Barnaby Jones (1973–1980). Originally a dancer, Ebsen began his career in Broadway Melody of 1936. He also appeared as a dancer with child star Shirley Temple in Captain January (1936). 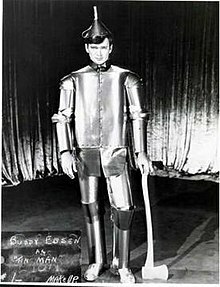 Ebsen was the original choice for the role of the Tin Man in The Wizard of Oz, but fell ill due to the aluminum dust in his makeup and was forced to drop out. He appeared with Maureen O'Hara in They Met in Argentina (1941) and June Havoc in Sing Your Worries Away (1942). In Breakfast at Tiffany's (1961), he portrayed Doc Golightly, the much older husband of Audrey Hepburn's character. Before his starring role in The Beverly Hillbillies, Ebsen had a successful television career, the highlight of which was his role as Davy Crockett's sidekick, George Russell, in Walt Disney's Davy Crockett miniseries (1953–54). A middle child with four sisters, Buddy Ebsen was born as Christian Ludolf Ebsen Jr., on April 2, 1908, in Belleville, Illinois. His father, Christian Ludolf Ebsen Sr., was a Danish choreographer, who once owned a dance studio and was also a physical fitness advocate, before operating a natatorium for the local school district, and his mother, Frances (née Wendt), was a Baltic German (specifically, Latvian) painter. Ebsen was raised in Belleville until the age of 10, when his family moved to Palm Beach County, Florida. In 1920, Ebsen and his family relocated to Orlando, Florida. Ebsen and his sisters learned to dance at a dance studio his father operated in Orlando. During his high school years, Ebsen became a member of John M. Cheney Chapter, Order of DeMolay. His involvement as a teenager led to his being recognized by DeMolay in adult life with the award of the Legion of Honor Degree, and later by induction into the DeMolay Alumni Hall of Fame. Ebsen graduated from Orlando High School in 1926. Initially interested in a medical career, Ebsen attended the University of Florida in Gainesville, Florida, from 1926 to 1927, and then Rollins College in Winter Park, Florida, from 1927 to 1928. Family financial problems caused by the collapse of the Florida land boom forced Ebsen to leave college at age 20. Ebsen left Orlando in the summer of 1928 to try his luck as a dancer in New York City, arriving with only $26.75 in his pocket, and worked at a soda fountain shop. His sister Vilma Ebsen and he performed as a dance act in supper clubs and in vaudeville — they were known as "The Baby Astaires". On Broadway, the Ebsens appeared as members of the chorus in the musicals Whoopee, Flying Colors, and Ziegfeld Follies of 1934. A rave review from New York columnist Walter Winchell, who saw them perform in Atlantic City, New Jersey, led to a booking at the Palace Theatre in New York City, the pinnacle of the vaudeville world. In 1935, Ebsen and his sister were approached by Metro-Goldwyn-Mayer for a screen test. They then signed a two-year contract, with a two-year option, for $1,500.00 per week each (equivalent to $27,411 in 2018). After relocating to Hollywood, the siblings made their film debuts in the 1935 film Broadway Melody of 1936. This was to be Vilma's only film — a contract problem prevented her making other films and she soon retired from show business. Ebsen went on to appear in numerous films, both musicals and nonmusicals, including the 1936 Born to Dance, the 1936 Captain January (in which he danced with Shirley Temple), the 1938 Broadway Melody of 1938 (with Judy Garland as his dance partner), and the 1938 The Girl of the Golden West. Ebsen partnered with actresses Eleanor Powell and Frances Langford, among others, and also danced solo. Ebsen was noted for his unusual, surreal dancing and singing style (for example, his contribution to the "Swingin' the Jinx Away" finale of Born to Dance). His abilities might have been a reason filmmaker Walt Disney chose Ebsen to be filmed dancing in front of a grid as an aid to animating Mickey Mouse's dancing in Disney's 1929 to 1939 Silly Symphonies animated short films. Ebsen turned down Louis B. Mayer's offer of an exclusive MGM contract, and Mayer warned him that he would never work in Hollywood again. Nonetheless, MGM cast him as the Scarecrow in its 1939 film The Wizard of Oz. Ebsen then swapped roles with actor Ray Bolger, who was originally cast as the Tin Man. Bolger wanted to play the Scarecrow, and Ebsen did not object to the change. Ebsen had recorded all of his songs as the Tin Man, attended all the rehearsals, and begun filming. However, he soon began experiencing body aches, muscle cramps, and shortness of breath, eventually leading to a lengthy hospitalization. Doctors determined that he was suffering a reaction to the aluminum dust used in the Tin Man makeup, and he was forced to leave the production. Ebsen recalled in an interview included on the 2005 DVD release of The Wizard of Oz that the MGM studio heads did not believe that he was ill until he was ordered back to the set and was intercepted by an angry nurse. Ebsen was replaced by Jack Haley, with the makeup quickly changed to a safer aluminum paste. MGM did not publicize the true reason for Ebsen's departure; even Haley was not told until much later. Haley re-recorded most of Ebsen's vocals, although Ebsen's Midwestern accent can still be heard on the soundtrack during several reprises of "We're Off to See the Wizard", with the enunciated "r" in the word "wizard", as opposed to Haley's Boston accent. Ebsen's recording of the Tin Man's solo "If I Only Had a Heart" is included on the Deluxe Edition of the film's soundtrack, while a still photo recreation of the sequence featuring shots of Ebsen as the Tin Man was included as an extra with all VHS and DVD releases of the film since 1989. For the rest of his life, Ebsen complained of breathing problems from his involvement in "that damned movie". Nonetheless, he outlived all of the major cast members of the movie, living into the 21st century. After recovering from the illness, Ebsen became embroiled in a contract dispute with MGM that left him idle for long periods. 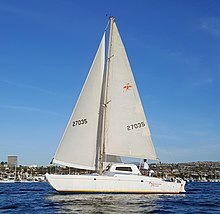 He took up sailing and became so proficient in seamanship that he taught the subject to Navy officer candidates. He applied several times for an officer's commission in the Navy in 1941 but was repeatedly turned down. The United States Coast Guard accepted his application for a commission, and he was promptly given the rank of Lieutenant, Junior Grade. This wartime rank was one step up from the rank of Ensign, the usual rank given newly appointed naval officers in peacetime. Ebsen served as damage control officer and later as executive officer on the Coast Guard-manned Navy frigate USS Pocatello, which recorded weather at its "weather station" 1,500 miles west of Seattle. These patrols consisted of 30 days at sea, followed by 10 days in port at Seattle. Ebsen was honorably discharged from the Coast Guard as a lieutenant in 1946. Ebsen made his television debut on an episode of The Chevrolet Tele-Theatre in 1949. This led to television appearances in: Stars Over Hollywood, Gruen Guild Playhouse, four episodes of Broadway Television Theatre, Schlitz Playhouse of Stars, Corky and White Shadow, the H.J. Heinz Company's Studio 57, Screen Directors Playhouse, two episodes of Climax!, Tales of Wells Fargo, The Martha Raye Show, Playhouse 90, Westinghouse Desilu Playhouse, Johnny Ringo, two episodes of Bonanza, three episodes of Maverick (in which he portrayed assorted homicidal villains), and 77 Sunset Strip. Ebsen received wide television exposure when he played Georgie Russel, a role based on a historical person  and companion to frontiersman Davy Crockett, in the Disneyland television miniseries Davy Crockett (1954–1955). In the 1958–1959 season, Ebsen co-starred in the 26-episode half-hour NBC television adventure series Northwest Passage. This series was a fictionalized account of Major Robert Rogers, a colonial American fighter for the British in the French and Indian War. Ebsen played the role of Sergeant Hunk Marriner; Keith Larsen played Rogers. In 1960, Ebsen appeared in episodes of the television series Rawhide, in the episodes "The Pitchwagon" and Tales of Wells Fargo, which he reprised in episodes of both series during 1962 in the roles of different characters. Ebsen also portrayed a corrupt, bloodthirsty marshal in "El Paso Stage", an episode of Have Gun, Will Travel broadcast in April 1961. Between October 1961 and March 1962, Ebsen had a recurring role as Virge Blessing in the ABC drama series Bus Stop, the story of travelers passing through the bus station and diner in the fictitious town of Sunrise, Colorado. Robert Altman directed several episodes. Arthur O'Connell had played Virge Blessing in the earlier film version on which the series was loosely based. Ebsen also appeared as "Mr. Dave" Browne, a homeless hobo, on The Andy Griffith Show opposite Ron Howard, and as Jimbo Cobb in The Twilight Zone episode "The Prime Mover" (season 2, episode 21) in 1961. Throughout the 1950s, Ebsen performed in films, mainly Westerns. One notable exception was an acclaimed role as Doc Golightly, an older, rural veterinarian deserted by his young wife (played by Audrey Hepburn) in 1961's Breakfast at Tiffany's. Paul Henning recalls his reason for choosing Ebsen to play Clampett: "I had seen him on TV and I couldn't imagine anyone else doing the role," he says. "I was fortunate to have him, because he became the cornerstone of the show." Ebsen became famous as Jed Clampett, an easygoing backwoods mountaineer who strikes oil and moves with his family to Beverly Hills, California, in the long-running, fish-out-of-water CBS sitcom The Beverly Hillbillies. Aside from the top-billed Ebsen, principal cast members included Irene Ryan as Jed's mother-in-law, Daisy Moses, also known as Granny; Max Baer Jr. as Jed's dimwitted nephew Jethro Bodine; Donna Douglas as Jed's only child, the curvaceous, critter-loving Elly May Clampett; Raymond Bailey as Milburn Drysdale, a bank president who oversees the Clampett fortune; and Nancy Kulp as Jane Hathaway, Drysdale's secretary. Although scorned by critics, The Beverly Hillbillies attracted as many as 60 million viewers between 1962 and 1971 and was several times the highest-rated series on television. The show also spawned similar Paul Henning-produced rural sitcoms such as Green Acres and Petticoat Junction, which were eventually linked in crossover episode arcs. The Beverly Hillbillies was still earning good ratings when it was cancelled by CBS (because programmers began shunning shows that attracted a rural audience). One episode, "The Giant Jack Rabbit", was the highest-rated half-hour on television to that time and remains[when?] the most-watched half-hour sitcom episode. Not all was harmonious among cast members on The Beverly Hillbillies set, especially between the politically conservative Ebsen and the more liberal Kulp. Said Douglas, "They had a different view, so they had some heated discussions about that. They would go at it for weeks." In 1984, Kulp unsuccessfully ran for the U.S. House of Representatives as a Democrat from Pennsylvania. To her dismay, Ebsen supported her Republican opponent, incumbent Representative Bud Shuster, going so far as to tape an ad for Shuster that labeled Kulp as "too liberal". Ebsen claimed she was exploiting her celebrity status and did not know the issues. Ebsen returned to television in 1973 as the title character of Barnaby Jones, which proved to be his second long-running television series. Barnaby Jones was a milk-drinking detective who came out of retirement to investigate the death of his son. Critics and CBS executives ridiculed the age of the show's audience, but it lasted 8 seasons and 178 episodes. When Barnaby Jones was cancelled, it was one of the last surviving 1970s detective dramas. Lee Meriwether, 1955 Miss America, played Barnaby's widowed daughter-in-law, Betty Jones. Ebsen appeared briefly as Barnaby Jones on two other productions: a 1975 episode of Cannon and the 1993 film The Beverly Hillbillies. Meriwether said of her on and off screen chemistry with Ebsen, "He really worked at being at the top of his game." "You had to keep up with him. I adored him. I think he had feelings for me, too." She also said of the man, "I loved that man! I was so lucky. He was a dream." "He loved the idea of being a detective. We had CSI-type equipment in the office on the set and he liked doing his own tests. It was a show the whole family could watch." Ebsen's last regular television series was Matt Houston on ABC, starring Lee Horsley. Ebsen played Matt's uncle, Roy Houston, during the show's third season from 1984 to 1985. He also appeared in "The Waiting Room", a Night Gallery segment that originally aired January 26, 1972. Ebsen narrated the documentary series Disney Family Album during the 1980s on the Disney Channel and Steven Kellogg's "Paul Bunyan" on the PBS series Reading Rainbow in 1985. He made his final guest-starring appearance in 1994 on an episode of the short-lived television series revival Burke's Law. Although generally retired from acting as he entered his 80s, Ebsen filmed a cameo in the 1993 film version of The Beverly Hillbillies as Barnaby Jones. This was Ebsen's final motion picture role. In 1999, Ebsen provided the voice of Chet Elderson for an episode of the Fox Entertainment program King of the Hill. This was his last TV appearance. Ebsen has a star on the Hollywood Walk of Fame at 1765 Vine Street, and a star on the St. Louis Walk of Fame. Ebsen died of respiratory failure at Torrance Memorial Medical Center in Torrance, California, on July 6, 2003, at the age of 95. Upon his death, his body was cremated and his ashes were scattered at sea. Ebsen was first married to Ruth Cambridge and they had two daughters. The marriage ended in divorce. In 1945, Ebsen married fellow lieutenant Nancy Wolcott. They had four daughters, including Kiki Ebsen, and a son. This marriage, after 39 years, also ended in divorce. 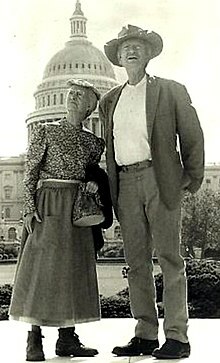 In 1985, Ebsen married his third wife, Dorothy "Dotti" Knott. They had no children. Throughout his life, Ebsen had many interests. He became a folk artist and an avid coin collector, co-founding the Beverly Hills Coin Club in 1987 with actor Chris Aable. Ebsen's collection included many rarities such as a four-dollar gold piece worth $200,000. The coin was sold in several auctions both before and after his death. As Ebsen entered his nineties, he continued to keep active, and two years before his death, his bestselling novel Kelly's Quest was published. Ebsen wrote several other books including Polynesian Concept (about sailing), The Other Side of Oz (autobiography) and Sizzling Cold Case, a mystery based on his Barnaby Jones character. Attack (1956) as Sfc. Tolliver - Fox Co.
Bonanza (1959) as Sheriff Jesse Sanders in the episode "The Sisters"
Riverboat (1960), as Niles Cox in "The Water of Gorgeous Springs"
The Twilight Zone (1961) as Jimbo Cobb in "The Prime Mover"
The Barbara Stanwyck Show (1961) as Dr. Mark Carroll in "Little Big Mouth"
The Andy Griffith Show (1961) as David Browne in "Opie's Hobo Friend"
Rawhide (1962) as Doctor George Stimson in "The Pitchwagon"
Bonanza (1972) as Cactus Murphy in "The Saddle Stiff"
Cannon (1975) as Barnaby Jones in "The Deadly Conspiracy: Part 1"
Burke's Law (1994) as Louie Pike in "Who Killed Nick Hazard?" King of the Hill (1999) as Chet Elderson in "A Firefighting We Will Go"
^ a b "Ebsen Viewed Fame As A Long Shot - Orlando Sentinel". Articles.orlandosentinel.com. 2005-11-09. Retrieved 2013-11-04. ^ Ebsen apparently joined the Screen Actors Guild using this name on February 13, 1937. Yaros, Valerie. "Early Members, 1933 – 1937: Frank "Buddy" Ebsen". SAG History. Archived from the original on 7 March 2005. Retrieved 10 December 2018. ^ McLellan, Dennis (July 8, 2003). "Buddy Ebsen, 95; Actor-Dancer Was Jed Clampett of 'Beverly Hillbillies'". Los Angeles Times. Retrieved 2010-10-06. ^ a b c d e "Buddy Ebsen, of 'The Beverly Hillbillies,' Dies at 95". The New York Times. 8 July 2003. Retrieved 17 June 2015. ^ a b McLellan, Dennis (8 July 2003). "Buddy Ebsen, 95; Actor-Dancer Was Jed Clampett of 'Beverly Hillbillies'". Los Angeles Times. Retrieved 17 June 2015. ^ "Buddy Ebsen". classicimages. 2006-08-25. Retrieved 4 January 2016. ^ "Stroke Fatal to Summer Visitor; Rites Are Held". The Times-News. July 21, 1951. Retrieved July 6, 2017. ^ "Wizard of Oz and Buddy Ebsen". snopes.com. Retrieved September 9, 2012. ^ SAG-AFTRA Early Members: 1937 Archived March 3, 2016, at the Wayback Machine Frank 'Buddy' Ebsen: "When I was cast as the original Tin Man in The Wizard of Oz (1939), I almost disappeared over the rainbow because of the poisonous aluminum dust in my silvery make-up. It cost me a big medical bill. If that happened today, the Guild would have taken care of it. SAG, long may they wave." ^ Cox, Stephen (1988, rev. 2003). The Beverly Hillbillies: A Fortieth Anniversary Wing Ding. Cumberland House Publishing; Rev Exp edition. ISBN 1-58182-302-9. ^ Williams, Janelle. "Re: George Russell". genealogy.com. Retrieved August 12, 2008. ^ National Archives and Records Administration. Index to the Compiled Military Service Records for the Volunteer Soldiers Who Served During the War of 1812. Washington, D.C.: Washington, D.C.: National Archives and Records Administration. pp. M602, 234 rolls. ^ "El Paso Stage", Have Gun, Will Travel, S04E30, originally aired April 15, 1961; TV.com, CBS Interactive, Inc. Retrieved March 22, 2019. ^ Murphy, Tom (12 February 1995). "Come Listen To A Story 'bout A Man Named... Buddy, Barnaby & Jed". Sun-Sentinel. Retrieved 17 June 2015. ^ "The Giant Jackrabbit: What is a Beverly Hillbillies Episode Doing on the TV All Time Most Watched List?". The Retroist. Retrieved 17 June 2015. ^ Folkart, Burt A. (5 February 1991). "Nancy Kulp; Foil in 'Beverly Hillbillies'". Los Angeles Times. Retrieved 17 June 2015. ^ "Feudin' Hillbillies: Jed Clampett Opposes Miss Hathaway's House Bid". The Palm Beach Post. 2 November 1984. Retrieved 17 June 2015. ^ Halperin, James L.; Mangus, Don; Dowell, Gary (2008). HMM Dallas Music and Entertainment Memorabilia Auction Catalog #688. Heritage Capital Corporation. ISBN 9781599672298. ^ "There she is .... Lee Meriwether; Classic Hollywood: Former Miss America Lee Meriwether has graced stage and screen for nearly six decades". Los Angeles Times. Archived from the original on 2016-03-05. Retrieved 2017-07-06. ^ Hingley, Audrey T. (June 9, 2014). "Where Are They Now? Lee Meriwether, Who Played "Catwoman"". boomermagazine.com. Retrieved July 6, 2017. ^ Benson, Jim; Skelton, Scott (1999). Rod Serling's Night Gallery: An After-hours Tour. Syracuse University Press. ISBN 9780815627821. ^ "Buddy Ebsen". IMDb. Retrieved 2018-04-30. ^ a b c d e Bergan, Ronald (10 July 2003). "Buddy Ebsen". The Guardian. Retrieved 18 June 2015. ^ a b c Silverman, Stephen M. (7 July 2003). "Actor Buddy Ebsen Dies at 95". People. Retrieved 18 June 2015. ^ "Amazon; Buddy Ebsen". Amazon. Retrieved July 6, 2017. ^ ""The Water of Gorgeous Springs", Riverboat, November 7, 1960". Internet Movie Data Base. Retrieved February 21, 2013.